Jim Ryan breaks down in front of the gates of a decaying old mansion. Hoping to find shelter from the cold, Ryan knocks and the door is answered by the owner of the house, Andrew Clymore, who invites Jim to stay the night. At dinner, a piercing shriek unnerves the guest but when he queries his host about the source, Clymore acts as though he heard nothing. Later, Ryan is awakened by the same piercing screams and realizes they're coming from behind a large door across the hallway. The next morning, the butler, Evers, pounds on Jim's door to give him the news that Mr. Clymore has died of a heart attack and his body must be cremated immediately. Jim decides it's time to find out the truth behind the strange goings-on in Clymore Manor. Evers relates the grim facts: Mrs. Clymore had been a victim of catalepsy and was buried alive until her husband heard her screams and saved her. A year later, she gave birth to a deformed son and died during childbirth; that baby has grown into a ravenous ghoul, living off body parts stolen from the family mausoleum. Just then, the beast tears through the wall, murders Evers and begins feasting on its dead father. While attacking Jim, the monster upsets a candelabra and the house is engulfed in flames. Only Jim survives. "Terror on the Moors" is like a bad Roger Corman-Poe flick, drawing heavily on the kind of Gothic drippiness that so many publishers filled their horror titles with. Unfortunately, even a year into this "New Direction," EC wasn't above clogging their arteries with the same kind of cheesy by-product. We're not privy to the reasons for Clymore Jr.'s deformity or his proclivity for rotten flesh; he's just built that way. Ostensibly, the beast has already chowed down on his mother's rotting corpse, which is a nastier image than any found in the story itself. As for Johnny Craig's work here--there's nothing much to it other than a load of talking heads with only the finale giving hints as to the true nature of the beast. Barton Gordon arrives at the apartment building he'll be managing only to find a chaotic situation: the landlord, living in the top floor apartment has turned his home into an icebox, complete with refrigeration units. Barton's orders are to keep the rest of the tenants happy while Marcus Kingsley continues his icy existence. When summer comes and the generator blows, Kingsly flies into a panic and demands that something be done quickly. As Barton scrambles to repair the machinery, a doctor arrives to reveal the truth: Marcus Kingsley is a walking corpse who needs the freezing temperature to keep himself intact. The two men open Kingsley's door to find they are too late; all that is left of the man is a puddle of black goo. Obviously "borrowed" from Lovecraft's "Cool Air," Feldstein's script would have benefited form a little more "shock" in the climax rather than a reveal on the prior page. If you put aside the words in the balloons and captions, "Baby, It's Cold Inside" is a triumph; Ghastly's first stone cold classic. All that's missing from the gruesome finale is an EC "-choke-." "Baby . . . It's Cold Inside!" Tom really wants to marry sweetheart June but the belief that his brother, Andrew, is a werewolf is putting a damper on romance. Determined to put an end to the nightly slaughter of innocent villagers, Tom sets a trap but, in the end, discovers the "Beast of the Full Moon" was really June! The one formula EC writers couldn't seem to perfect (at least through 1951) was the werewolf yarn. They've had several stabs at it and each one seems to get worse. This is the worst yet, pedestrian in its delivery and ludicrous in its payoff. So, does June change from her pretty dresses into a man's clothing before going out hunting at night or do the purple trousers come with the transformation? Jack Davis is going to get a whole lot better (and have denser material to work with as well) pretty soon. 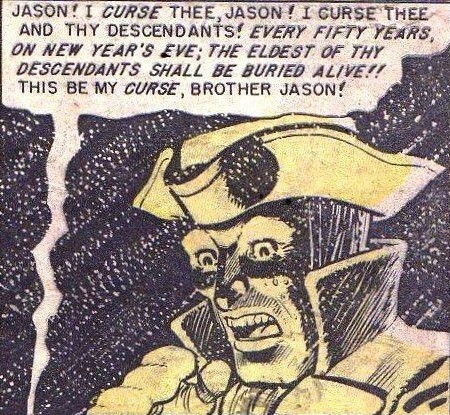 "Curse of the Full Moon"
Jack: The Ingels story is by far the best to me, mainly due to the brilliantly Ghastly art. The Old Witch is almost decomposing in the splash panel and it looks like she's composed of rain! Having a solid story to work with really lets Ingels soar. I liked the Craig story well enough, though you do point out its flaws and the monster at the end is a disappointment. 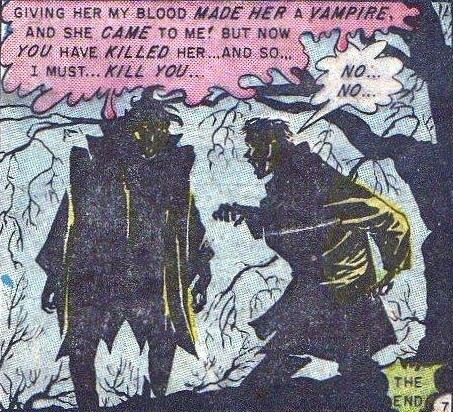 Johnny Craig should stick with suspense and stay away from pure horror. 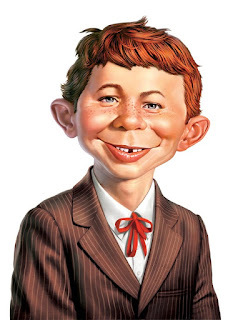 Davis's art is not that of the Jack Davis we all know and love yet but I'll admit I didn't see the twist ending coming in advance! And I love a good voodoo story, but the Dorian Gray ripoff courtesy of Kamen is sleep-inducing. Jose: I remember “Terror on the Moors” being a little peppier the first time I read it, but the fog-drenched atmosphere that had been so enjoyable to me then seemed a bit lacking here. Jack brings up a good point—Craig was much more adept at suspense and mental anguish than classical horror, as some of my favorites of his that we have yet to see draw more on the fissured psychologies of his characters and the invasion of the gruesome into quotidian life. I hope our readers enjoy broken records, because I suspect our praise for Ingels’s art is going to become the soundtrack of this EC marathon, especially in regard to the horror titles. The Lovecraft rip is pretty solid, minus the slight deflation that Peter mentions, but Graham is up to the task as always, giving us the drippy, oozy wretchedness that we love. 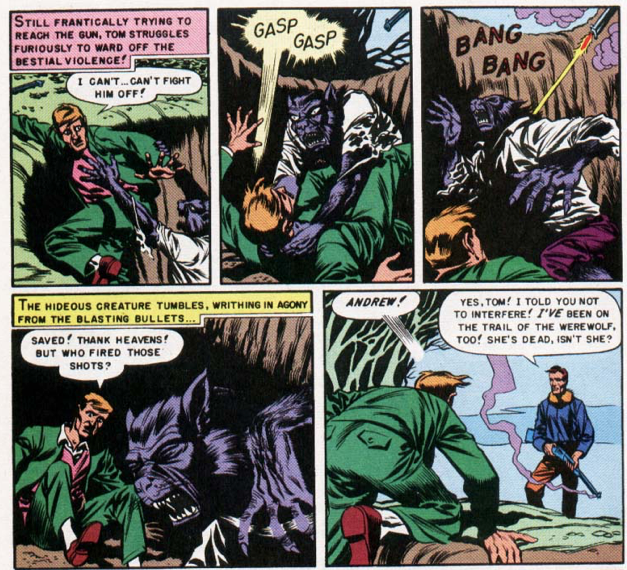 I recalled “Beast of the Full Moon” being slight, with the exception of that boss splash panel, but the cross-dressing werewolf was more apparently ludicrous by a long shot this time. And “Voodoo Horror”? Jack got it on the nose; I think my eyes actually did start drooping. 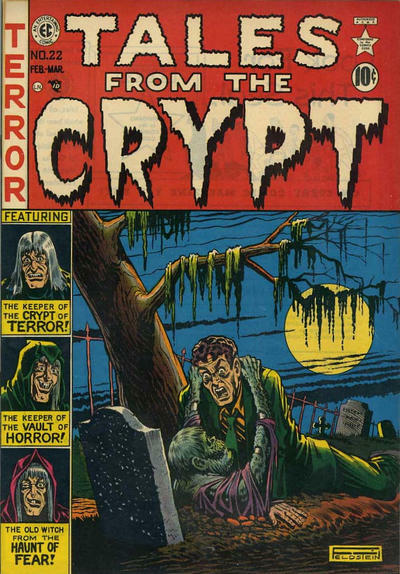 John: Based on the cover, I went in expecting “Terror on the Moors” to be our werewolf tale this issue, so it was somewhat of a pleasant surprise when it turned out to be the ghoulish monster child; one might say "Born of Man and Woman." 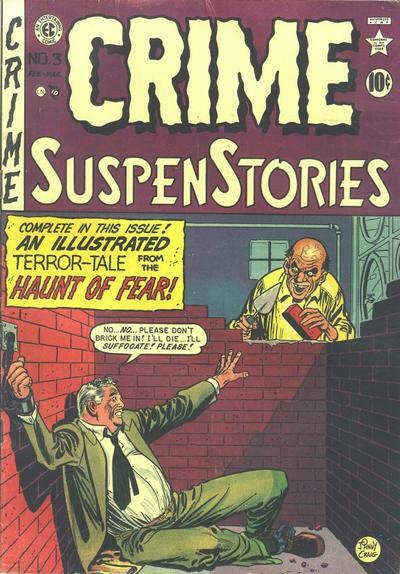 Perhaps it's just a coincidence that this story echoes Richard Matheson's first published work from 1950 (albeit told from a far less interesting perspective). I'm not a fan of stories where the protagonist, Jim Ryan in this case, exists solely to provide narration to the story. His arrival at the house doesn't set things in motion, and his presence doesn't prevent any of the bad things that happen. By the time he walks away unscathed at the end, I didn't even care. "Baby . . . It's Cold Inside!" was amusing in that as soon as you see Marcus Kingsley, it's clear he's basically a walking corpse. Still, it was a fun, albeit ridiculous story. I'm open to all kinds of explanations for a dead man walking around, but surviving the proactive removal of his heart is a stretch even for me. I did like how he basically went all melting man at the end. As we should have expected, when our werewolf yarn finally arrives in the form of "The Beast of the Full Moon," it's a stinker. Raise your hand if you saw the twist coming from a mile away. I think Peter points out the best part in that final panel; perhaps June identifies as a male werewolf. "Voodoo Horror!" 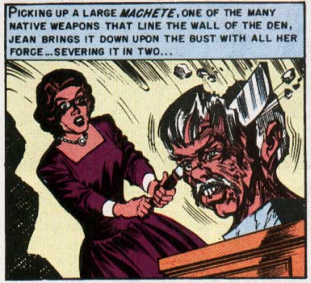 has a nice payoff (and we actually get to see a head split with a machete, albeit a wax one, though I can't imagine why Jean would shack up with George. Sure, if she knew she had to do it to save the old man, but there's no indication that she's in it against her will--she really only seems to hate the bust), even after he slaps her around a bit. Well, George gets it in the end, which saves this one from being a complete waste of time. As we’ve seen with several other artists in recent issues, Wally Wood fully comes into his trademark style in this wonderfully gritty hardboiled egg. “Faced with Horror” trades on some hallmarks of the genre, namely the criminal who undergoes plastic surgery to elude the fuzz, and Wood serves it all up with illustrations that have all the swagger of prose by Chandler or Cain. The panels seem inadequately equipped to contain the characters’ bursting forms and, as Jack points out, sometimes they don’t. With this story, Wood demonstrates that he is the master of action. Also in this issue are not one but two stories, back-to-back, that have husbands briefly exulting in the freedom afforded them by killing their terrible, terrible wives. We don’t see the murder take place in Johnny Craig’s “Poison,” we only hear about it from our gloating protagonist whose braggadocio is cut off at the knees by his housekeeper’s insinuation that she knows what really happened to her former mistress. Boles is understandably frightened and gives in to Elsa’s demands lest he face a death sentence. His funds all but sapped, Boles hits on the bright idea of imbibing the very same poison he used to off his wife and then placing all the blame upon Elsa. Boles gets a little too deep into his cups, and when he awakens from his stupor he’s told by the attending physician that he was roused with two full tumblers from the bottle of whiskey where Boles had hidden the poison. Although Craig’s work is perfectly adequate here, there was a certain “safe” quality to the story that kept me from ever getting fully caught up in the events, a pity since the twist was pretty good. An uneasy glimpse of death from "The Giggling Killer"
More poetic justice is served up to the henpecked loser in Harvey Kurtzman’s “The Giggling Killer.” Loman not only shares similar homicidal thoughts with Mr. Boles from “Poison” but an identical sense of cunning that involves marking another criminal as the true perpetrator of the crime. Reading the detailed reports of the eponymous murderer in the newspaper, Loman figures he can easily replicate Giggly’s M. O. and escape persecution by staging a simultaneous “business trip” to Chicago to act as his alibi. The plan goes off without a hitch when Loman garrotes his shrewish partner and marks the corpse’s forehead with a lipstick triangle, but Loman’s return trip is ruined when he decides to pick up the wrong hitchhiker. 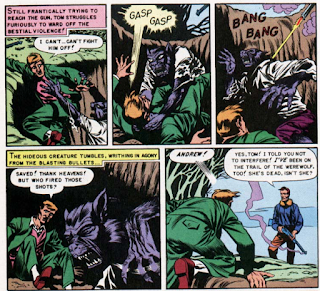 Credulity and patience are strained in equal measure with Kurtzman’s story following Craig’s so closely, and even the former’s typically unique art looks rushed and unattractive here. 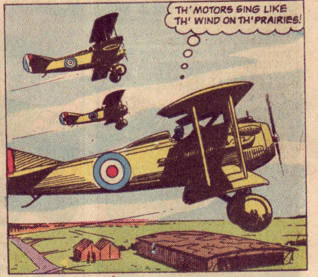 A sign that Kurtzman was becoming more preoccupied with the company’s war titles? 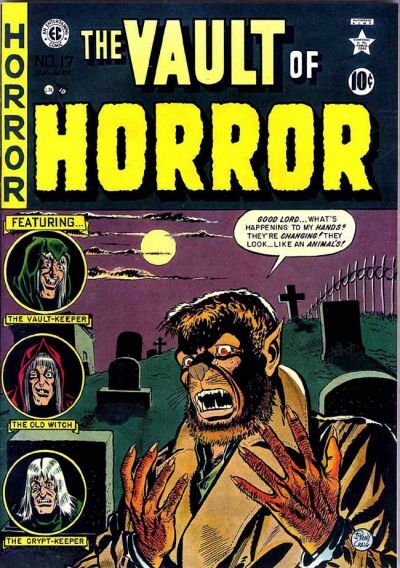 Peter: While the Ghastly art for "Blood Red Wine" is fabulously creepy (Graham's characters, more and more, seem to be reverting to their simian roots), the highlight of the issue, for me, is Wally Wood's noirish masterpiece, "Faced with Horror." Wood's characters are almost three-dimensional, especially the heater-loving Brogen. We've watched Wally evolve in the past few posts (although the earlier work may have been muddied by diverse hands) and here it's as if he's turned the corner and become "Wally Wood," the artist who would revolutionize science fiction funny books in the 1950s. According to Tales of Terror/The EC Companion, "Poison!" is inspired by "The Interruption," by W.W. Jacobs, author of "The Monkey's Paw" (which would be famously adapted for The Haunt of Fear in 1953) and inspiration for "Blood Red Wine" comes from Poe's "The Cask of Amontillado." The difference in adaptation and source is that Poe let the guilty go free. Jack: For me it was a tie between Ingels and Wood for best story of the issue. Wood's art here alternates between photo-realism and classic Wood. 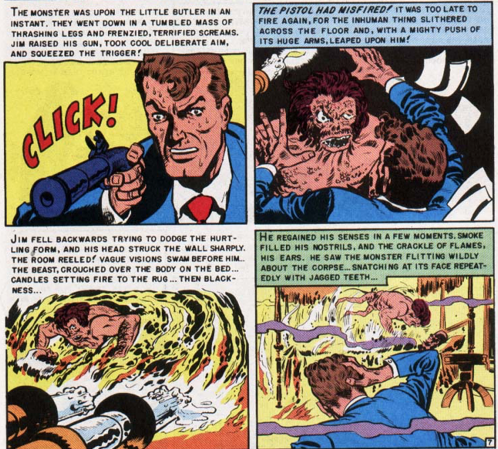 I see an Eisner influence in the panels where the plastic surgeon is killed and the horrible face at the end is all that Johnny Craig's monster in this month's Vault of Horror was not. It's interesting that the last panel implies that the main character plans to commit suicide. 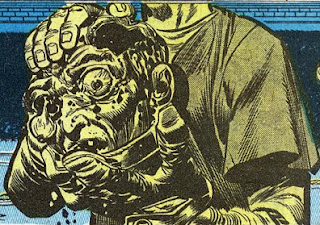 Dr. Wertham was shaking his head in disgust. The Ingels art on the Feldstein/Poe story is simply stunning--his second majestic work this month. For once, the story actually gives credit to the original author! 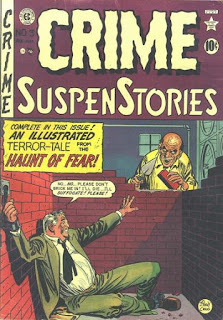 Kurtzman's story is fun but not his best work, though the panel where the murder takes place reflected in shadows on the wall is great and I love how the husband giggles extra loudly to make sure the neighbors can hear him. Craig's story is probably the weakest, though not bad at all. There is a strong Eisner influence throughout and I love hard-boiled dame Elsa, who seems to have a cigarette dangling from her lips throughout the story. John: I was ready to drink the "Poison!" by the end of the first tale, and Kurtzman's art once again turned me off; I just can't take the stories he illustrates seriously. Fortunately, "Faced with Horror!" was a good story, with a great creepy reveal at the end. The splash page of Brogen reminded me a bit of Frank Miller's Marv from Sin City. Having read enough issues with no redeeming qualities, I guess I shouldn't complain when there's one good one in the contents. Pretty Laura Mason chooses kind James Barry to marry instead of scary Bill Ferth, so when Jim goes on a business trip Laura fears for her safety. Jim swears that, if she's ever in danger, he'll save her, no matter where he is. Bill waits in the middle of a lonely road for Jim and murders him when the car stops. After Bill buries the body and sinks the car in a lake, he waits awhile before going to see Laura. She still carries a torch for Jim, so a disappointed Bill admits that killing her husband was a waste of effort. He says he has to kill her too! 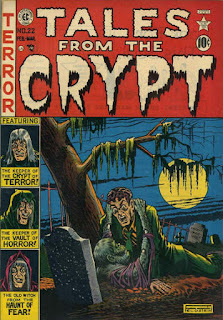 Bill locks Laura in her cabin and sets fire to it, but her shrieks cause Jim to rise from the dead and "The Thing From the Grave" shambles along and rescues Laura. Bill conveniently trips and falls into Jim's grave, and the rotting corpse joins him and pulls the dirt back in, burying the two former rivals together forever. "The Thing from the Grave!" What fun! Feldstein sure can draw a great, rotting corpse and Laura is a honey. This is what I would call a story in the classic EC tradition. Driving too fast down a deserted road at night, Freddy and Jean's car crashes into a fallen tree. Fred staggers for help and calls Doc Benson, who examines Jean and announces that she needs a blood transfusion. A spooky man pops up from out of nowhere and offers to give his blood to Jean, since it turns out he and she share "Blood Type "V"! After Jean disappears from the hospital, Doc mentions that he saw a couple of bite marks on jean's neck and everyone realizes that there's a vampire about. Jim returns to the scene of the crash, where he finds and stakes the vampire. Unfortunately, it turns out to be Jean. The spooky guy shows up and admits he's a vampire, too. He fell in love with Jean and turned her into one of the undead with the blood transfusion. Having failed to talk Jim to death, he announces that he will use another method to kill him. Ingels's art in this story isn't quite as big a knockout as the other two stories he contributed this month, but it's still great. Feldstein's story is a bit of a muddle and we just saw this same twist ending this month in the werewolf story in Vault. Kane and Crossen own a failing amusement park but when Bixby comes along with plans for the world's fastest roller coaster, they agree to make him an equal partner. The giant new ride is built and the original partners decide it's "Death's Turn! "to act, so they push Bixby in front of a speeding roller coaster car, killing him instantly. They hush up the death and soon open to a big crowd. Kane and Crossen are the first to ride the super coaster but when the car arrives at the end, they are dead, having failed to realize that no human could survive the speed without suffering a broken neck. Kamen's art works better than usual in this story, which is pretty good until the flat ending, which requires a last-panel explanation by the Old Witch. It's New Year's Eve of 1950, and Robert Arnold is looking in the attic for some clothes to wear to a costume party when he happens upon a book titled "The Curse of the Arnold Clan!" He reads it and discovers that, due to a fratricide in 1750, the eldest Arnold will be buried alive every 50 years on New Year's Eve. Guess what? Robert is the eldest Arnold and tonight is 50 years since the last tragedy. At the costume party, Robert participates in a scavenger hunt and ends up at the cemetery where his ancestor is buried. Robert manages to lock himself in his ancestor's coffin and fulfills the prophecy. "The Curse of the Arnold Clan!" Peter: A very weak issue for me, with just two positive aspects of the issue to keep the pages turning. "The Thing from the Grave" is readable mostly due to its charming campiness. I love how when Jim catches up to Bill and takes him to his grave, the hole is already dug. I want to see the missing panels where Feldstein shows Jim digging the grave with the handy shovel before setting off to find his murderer. Ghastly's art is the only reason "Blood Type V" gets two stars from me. Ingels's vampire is no suave Hungarian with table manners but, rather, a giant bat-monster. The reveal is too predictable, though. The remaining two stories are immensely forgettable. 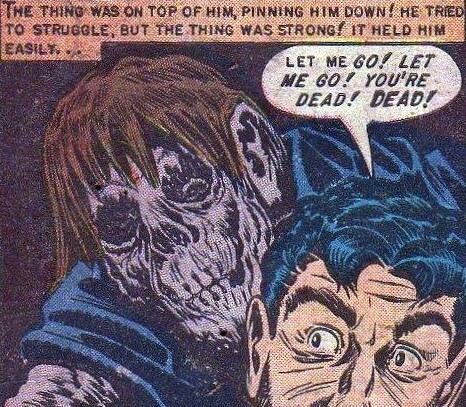 Jose: “The Thing from the Grave” may very well be the ur-text of “vengeful corpse” stories in the pre-code comics; it reads like it’s the first time all the requisite pieces fitted together to compose a satisfying whole. (Or hole, in the case of our tireless zombie.) Feldstein smoothly draws the action out over the eight pages so that it never feels drawn-out or lacking. It’s just right, like Baby Bear’s porridge. “Blood Type ‘V,’” however, appears to cram two separate storylines in with neither of them really taking off. It’s built very much on convenience, but perhaps not as offensively as “The Curse of the Arnold Clan,” a story whose ghostly legend-vibe is shattered when Feldstein has his hero make some ridiculously inane decisions all for the glory of winning a prize at a New Year’s scavenger hunt! “Death’s Turn” is much like the roller coaster at its center, mathematically sound in construction but hampered by a minor flaw, this being the lukewarm art of Jack Kamen. I’m still holding out hope that we’ll be seeing the artist take some exhilarating twists and turns soon. John: Our first tale this time out, “The Thing from the Grave,” is cut from very familiar cloth, though Feldstein's rotting corpses are always a welcome sight. I was pleasantly surprised by the final twist; it was clear Bill was going to end up in the grave he dug for Jim, but it was clever to have Jim join him for their eternal rest. "Blood Type V" reminded me of a story Peter wrote (under a pseudonym) for our 'Worst in Horror' issue of The Scream Factory, notably mocking just this sort of cliché ending used here. "Death's Turn" shows us that the building of a roller coaster does not make for an interesting comic story, even with a splash of well-deserved deaths. In "The Curse of the Arnold Clan!," we're asked to believe that someone would go to the trouble of digging up a grave in order to win a scavenger hunt. Ray Russell had a better idea ten years later in his story "Sardonicus," when he had a son dig up his father's grave to get his winning lottery ticket. Jack: Sounds like "Post Mortem" by Cornell Woolrich. FYI: "Terror on the Moors" is a retelling of Clark Ashton Smith's "The Nameless Offspring". Jon, thanks for reading and for leaving a comment. Is there no end to EC's uncredited adaptations of classic horror and science fiction stories?